Tita finally came to visit us both yesterday. 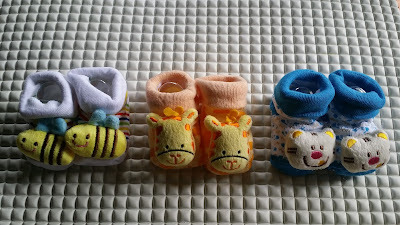 Three pairs of baby shoes... Shoo cute! Feel like taking Sofia to the zoo in this! Eventhough Sofia is our first baby, and as a matter of fact, the first grandchild for both my parents and in-laws, most of her stuffs are not brand new. In other words, most of her stuffs are hand-me-downs. Especially clothes. We got two huge bags of baby clothes (mittens, socks, barut, napkins, hats) from our next door neighbour and Iz's friend, a strolley given by fil's friend, and a baby chair from the same couple who gave us the baby clothes. Well, we did buy her some new clothes. Less than 10 pieces kut. Hahaha. We bought 2 rompers, 2 nighties/ overalls, 1 set of clothes (long sleeve, long pants), and just ONE set of mittens and boots. Okay. SIX. Six only. At first we didn't want to buy any new clothes but then I thought it would be so kesian to wear hand-me-downs on the first day being born... So we bought one romper. Which she wore on the day we were discharged from the hospital. I guess we spend more on other essentials. Though we were quite cheap on clothes (not even RM100 for all the clothes we bought), we did spend a lot on getting her better pampers. She wore Huggies, kut... Which is expensive! Cry, cry... We got her a nice playpen and bought a mosquito net. We were very thankful that she received a lot of gifts! A lot of new clothes. Rezeki Sofia, Alhamdulillah. Now that she's already one month, she's starting to outgrow some clothes. But no worries, the clothes we received can be worn up til' 6 months! Hehe. alolo comelnya. you dah habis pantang ke dear? yelah biasanya budak cepat membesar. dah tak muat, bagi lah kat orang kan. I pun dapat seplastic besar for my babygirl dulu. comel comel pulak tu. Baruuuu je habis pantang ni. Hehe. Betul, sekarang pun ada yang dah tak muat..
Bash, syok kan ade babyyy. hiks. Suya beli baju boleh tahan banyak. sebab malas basuh. kumpol 1 machine, baru basuh. plus xshare ngn kitorg. so we make sure we have at least 2 weeks punye stok. hehehehehe.